Two of the most storied programs in college lacrosse battled for the top seed in the upcoming Big Ten Tournament and the newly donned Rivalry Trophy. 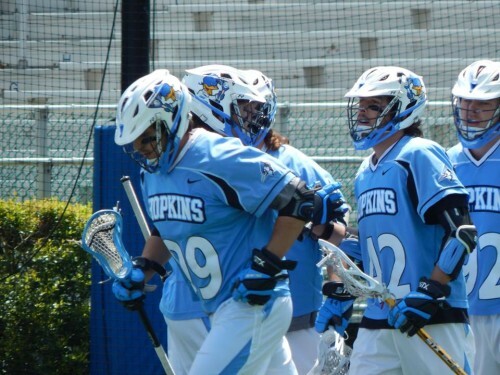 Johns Hopkins surged in the second half to a 15-12 win. Overcoming an early deficit and with junior Ryan Brown’s eight goals, Hopkins will be the top seed going into Thursday’s tournament. Maryland started early and often. Sophomore attackman Matt Rambo started the scoring with the first two goals of the game to give the home team an early advantage. Rambo first drove to the goal, beating Hopkins starting goalie Eric Schneider. The second coming on an extra man opportunity. Hopkins would answer with a goal from freshman midfielder Joel Tinney, but Maryland would score again off the ensuing faceoff when Jay Carlson was found alone in front of the net. Carlson would get the next goal as well, both assisted by senior Joe LoCascio. Maryland would hold their largest lead of the game at 4-1. Hopkins would answer with two unassisted goals to cut the advantage to one. John Crawley dodged to the middle of the Maryland defense and was able to beat senior netminder Kyle Bernlohr. Tinney would score on the run to make the score to make the score 4-3. LoCascio would close the scoring for the quarter with 3:52 remaining to give the Terps a 5-3 lead going into the second quarter. Senior Wells Stanwick would bring the Blue Jays back within a goal when he scored to open the second quarter. Locascio would be the only Terp to score in the quarter, scoring two, with his first of the quarter and second of the game. Hopkins would have the benefits of the first two goals from Ryan Brown and another from Shack Stanwick. In the contest, Brown would eclipse the half century mark in goals for the season. At half, Maryland would have a 7-6 advantage going into the final thirty minutes of the Big Ten regular season. Maryland would start the scoring with Colin Heacock and Bobby Gribbin goals, sandwiched in between Hopkins ryan Brown’s third goal of the game. With 6:38 left in the quarter, Hopkins was able to capitalize on one of their two extra man opportunities of the game when Brown scored first fourth goal, assisted by Crawley. This tied the game at 9. Three minutes later, Maryland would take a one goal lead again when Carlson scored his third of the contest. As the fourth quarter started, Ryan Brown saved his best for the last quarter. After being down 10-9, Hopkins would score six unanswered goals to take a commanding 15-10 lead into the final minutes. Brown would score two goals in ten seconds to get momentum on the Jays side. The second of which came in transition when senior long stick midfielder Michael Pellegrino found him open. Holden Cattoni would scored unassisted for a 12-10 lead. Brown would score unassisted for his fiftieth of the season. Tinney would score his twentieth of the season for a 14-10 lead. With 2:01, Ryan Brown finished an alley-oop from Wells Stanwick for the 15-10 lead. The Terps would get the last two goals of the contest. Bryan Cole and Henry West would both score, but it was not enough. The Jays celebrated by walking off the field with the Rivalry Trophy, which was introduced to the game against the two teams this season and will be given out annually to the winner. Hopkins will take on Penn State, who they defeated in overtime two weeks ago, this Thursday at College Park in the inaugural Big Ten Tournament. Brown’s eight goals led the way and the second half netminder Will Ryan had four key saves in the second half run. Maryland will take on Ohio State in the second game of the tournament on Thursday.